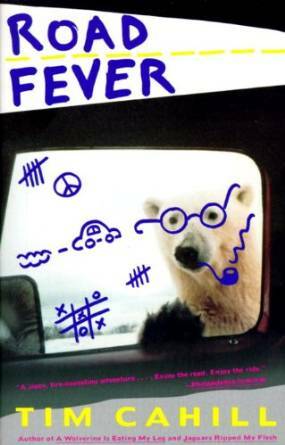 Recently I finished a book called Road Fever. It’s the story of a 1987 attempt — which ultimately was successful — to drive from the tip of South America to Alaska in world record time. Travel writer Tim Cahill joined professional long-distance driver Garry Sowerby for an approximately about 15,000 mile drive from the southernmost tip of Tierra del Fuego to the northernmost terminus of the Dalton Highway in Prudhoe Bay, Alaska, in a brand new GMC Sierra truck, as part of a promotion for the newly redesigned truck. With lots of support from GMC and American and Canadian embassies, Cahill and Sowerby managed to make it in under 24 days. Now, it turns out that you can’t actually drive straight through from Tierra del Fuego to Prudhoe Bay because of the Darién Gap — a 99 mile long break in the Pan-American Highway consisting of a large swath of undeveloped swampland between Panama and the northern end of Colombia — so for that portion of the trip the boys had to put their truck on a container ship. But they still managed to get the Guiness World Record, which it appears that they still hold. This trip took place back when Manuel Noriega was still running Panama, the Sandinistas were still in power in Nicaragua, and Carlos Lehder was still running the the Medellín Cartel in Colombia. What’s interesting is how much support Cahill and Sowerby needed to get through these South American countries. Their truck had to be reinforced with armor plated materials (which didn’t help their gas mileage, needless to say). They needed instruction in how to escape from bandits, should the need arise. They were escorted by employees of the Colombian branch of GMC for their entire trip through Colombia. They needed the intervention of the American and Canadian embassies to get through Honduras and Nicaragua. They received protection and support from other people in other countries. And then they reached the United States and Canada, where everything was easy-breezy. When entering Canada, they were essentially waved through by an unarmed Canadian border guard with barely having to come to a stop. Now this was in 1987, but I don’t think things have gotten much better in South and Central America. We forget sometimes, how good we have it up here, in North America. Even though Texas is still a part of the United States — and how much better would things be if it weren’t? — we still have it so easy when it comes to questions of daily existence. Jade Helm 15 notwithstanding, we really don’t have to worry about our military. We essentially don’t have to worry about graft or corruption. If you don’t count the purchase of elections by corporations. There are so many things that we don’t really have to worry about that people in other countries do. We should stop and be thankful now and then. This entry was posted in Politics and tagged road fever. Bookmark the permalink. Wow, that sounds like a really interesting read! I love stories about people’s travels–I feel like people have so many important experiences and realizations about themselves when they go on long trips like that.